For thousands of years, people have altered the meaning of space by reshaping nature. As an art form, these architectural landscape creations are stamped with societal imprints unique to their environment and place in time. 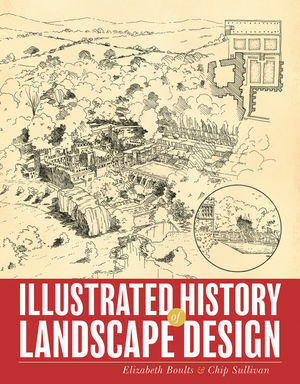 Directing both students and practitioners along a visually stimulating timeline, Illustrated History of Landscape Design is a valuable educational tool as well as an endless source ofinspiration. Elizabeth Boults is a landscape architect and educator. She maintains an art-based practice in Berkeley, California, and teaches in the landscape architecture programs at University of California, Berkeley Extension, and University of California, Davis. Her subject areas include drawing, design, and history. Chip Sullivan is a Professor of Landscape Architecture at the University of California, Berkeley. Author of several books, he is the recipient of the Rome Prize, among many other national and international awards. He currently writes an ongoing series of illustrated articles for Landscape Architecture magazine. Western Europe: Walled Minds, Walled Gardens. Moorish Spain: An Indelible Influence. China: Nature’s Splendor in a Garden. Japan: In the Spirit of Nature. Central Asia: Timurid Garden Cities. Italy: Curious Minds, Broadened Vistas. Italy: The Rebirth of Rome. Renaissance Gardens in France and England. The Early Botanic Garden: An Encyclopedia of Plants. Early Mughal Gardens: Persian Art Forms Travel East. The Mughal Empire: Sacred Symmetries. The flowering of the Dutch Landscape. English Gardens: A Restrained Mix of European Styles. French Classical Gardens: The Control of Nature. England: The Development of the Landscape Garden. The Landscape Garden in France. Early American Gardens: Homeland Traditions. England: The Victorians and Their Plants. The Glided Age: Extremes of Wealth and Poverty. The New Aesthetic of Modernism. Environmental Art: Nature as Medium. Artistic Trends in Landscape Design. A Sustainable Earth: Ten Ideas.